Google's firing back at Bing with a brand new visual image search feature. Google Image Swirl, announced on Tuesday, brings layers of similar images into your searches. Think of it like six degrees of separation, only customized to your image search interests. Google Image Swirl -- not to be confused with Bing's recently launched Visual Search for images -- works by building clusters upon clusters of related images. You start by simply surfing over to the Google Image Swirl page within the Google Labs site. There, you'll see a familiar-looking prompt asking you to enter your image search term. As you'll see, each option is not merely a single image; rather, it's a grouping of related images, visually represented by what appears to be a stack of pictures. Click on a grouping, and the real swirling begins. Google Image Swirl swirls in a set of circles, each containing multiple clusters of images. And every subgroup has a different theme. In my "potato salad" search, for example, the image on which I originally clicked sits in the center of the main circle. 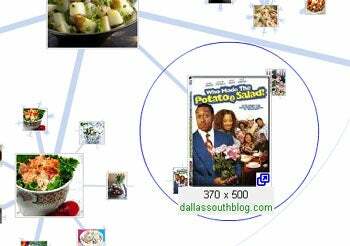 From there, I can see images showing numerous other kinds of potato salad, each with its own set of related images branching out from the core. There's even one cluster featuring what appears to be a delightful romantic comedy about everybody's favorite picnic staple. 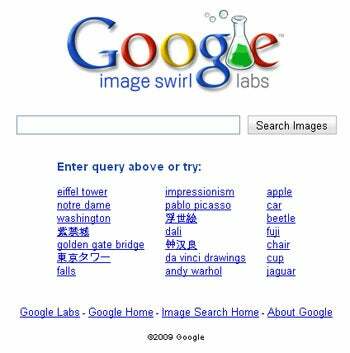 Now, Google Image Swirl is still relatively limited in scope: You can currently search for only about 200,000 terms that have been selected for inclusion. I learned this the hard way when I attempted to perform a Google Image Swirl search for Bobcat Goldthwait. 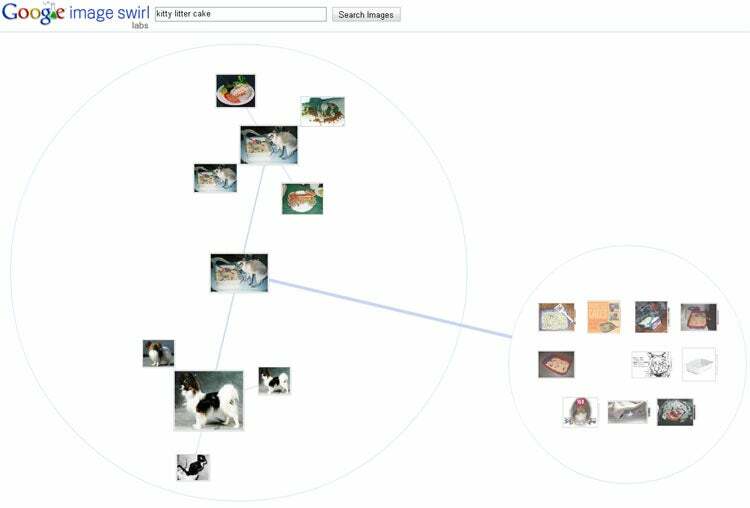 With that being said, many random terms are available within the Image Swirl demo -- including, rather inexplicably, both "a bathing ape" and "kitty litter cake." If the Image Swirl setup looks familiar to you, it might be because of its similarity to Google's Wonder Wheel system for text-based search queries. Image Swirl, though -- while in the same family as the Wonder Wheel -- has a different engine under its hood. Google says the system uses concepts developed for its recently unveiled Similar Images feature as well as technology created for its new Picasa Face Recognition function. And, lest you think all those buttery swirls are just some random assembly, Google assures every thumbnail represents "an algorithmically-determined representative group of images with similar appearance and meaning." I can't speak personally to that, but I can tell you one thing: Potato salad has never looked so impressive. JR Raphael cooks tech-inspired cuisine at eSarcasm, his gourmet kitchen of geek humor. You can keep up with him on Twitter: @jr_raphael.